God our Father forgives our sins through Jesus Christ that we might enjoy fellowship with Him and be turned into servants for His own purpose. We are created to glorify God by enjoying Him forever. The teachings in this catalog are designed to help you fulfill God's purpose for your life. You are created for God. He made you. Be open to God's creative purpose. He desires you to be a vessel in whom He is glorified, one who worships and serves Him, one who enjoys Him forever. May the Holy Spirit bring upon you the blessings of Christ as you walk in truth with Him. 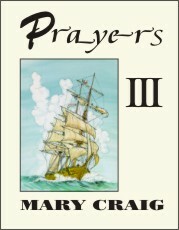 Mary Craig's books and study manuals consist of focused Bible-based prayer, strategic warfare, and deep scripture studies. They will help you to know God in a much deeper and life-changing way, and prepare you to do spiritual warfare as God as taught her through her own studies and practice in the field. With the prayer manuals, you can pray the prayers, gain breakthroughs and overcome the enemy through understanding and making Bible-based appeals to God. We have heard and received numerous testimonies of answered prayer and deliverance from people who have used these in their prayer life and ministry. You can order using PayPal®, your credit card, email or by phone at 954-491-7270. •Click any "Add to Cart" button to add the item to your shopping cart. •Please wait a few seconds for the shopping cart to appear. Do not click on a button more than once. Clicking more than once will delay the cart and add to the quantity of your order. •Click a "View Cart" button or "Begin Checkout" (bottom) to complete your order. •To order by email click here* To order by phone, call 954-491-7270. Do not use the shopping cart buttons if you order by email or by phone. Be sure to add shipping and handling charges below. Tap into the power of the Word! Our best-selling book, complete with scripture references, provides you with 22 prayers for deliverance, peace, healing, hope, grace, blessings, purity, and more. More powerful prayers for the family, trusting, praise, assurance, breaking generation curses, faith, praying against evil, entering God's presence, and more! Spiritual warfare prayers for victory in Christ, honor, breaking leviathan, overcoming rejection, death, poverty, and prayers for the lost, for nations, for ambassadors of Jesus Christ, for unity in the Body of Christ. 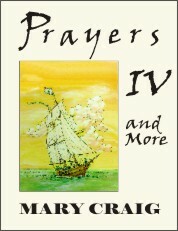 Continues the Prayer Series by Mary Craig with prayers, articles, and sermons. Click here for some sample prayers from the prayer manuals. 12 Lessons for personal study to help you understand healing and the nature of God, healing as the provision of God, healing through history, how to minister healing, prayer and fasting, forgiveness, curses, deliverance and healing, and the Holy Spirit. 12 sessions on wholeness according to the Word of God, including repentance, forgiveness, restoration, faith, prayer, and more! Includes readings, principles, discussion questions, and personal response sections. 75-page manual for study groups. A Bible study that will help you deal with your feelings and emotions by applying God's love and His Word to your life as the Holy Spirit produces His fruit in you. God gave us our emotions and wants us to use them for His glory. Become the person you can be in Christ! An excellent guide to a biblical approach to dealing with fear, worry, depression, loneliness, anger, uselessness, pride, change, and more. 117 page manual with discussion questions for study groups. A self-discovery Bible study with questions to foster a closer relationship with God as He speaks and reveals Himself in His own Word as to His love, grace, holiness, justice, mercy, and more. 63-page study with questions for study groups. This study will challenge you to realize your riches in Christ and respond to your responsibilities in Christ by embracing the truth of God's Word as to your spiritual inheritance and identity in Christ. In this study you will discover how you can walk in unity, in purity, in love, in harmony with others, and in victory as a child of light. Take off the grave clothes and enter the glory! Walk in the power of Christ's resurrection, embracing, engaging, and enduring in the glory that is Jesus Christ. Victory in the encounter with evil in everyday life comes as the Person of Christ confronts people of the lie. Prepared for use in conjunction with the case studies in M. Scott Peck's book, People of the Lie, this study will help you discern between evil and sin, recognize masters of disguise, judge according to the truth, discern when and how evil operates, and help you grow in your understanding of God's goodness and true love. Note: You will need to obtain Dr. Peck's book, People of the Lie, to properly use this study guide. It can be obtained new or used at Amazon.com. We don't necessarily recommend his other books, though they may be ok for the biblically discerning reader. The focus for the overcomer must be on the person of Jesus Christ. Dr. Craig's The Person of Christ will help in understanding and overcoming evil according to biblical truths using People of the Lie as a source for discussing Dr. Peck's case studies. An in depth study of the gospels, Acts, and Revelation in chronological order examining the life, death and resurrection of Jesus Christ. The 21 lessons include a teaching portion and a "Digging Deeper" section for individual search and discovery. This teaching by Dr. Craig has been designed to enable you to identify the purpose for which you were created; pursue relationship with the One Godhead; prepare yourself to enter His Presence; present your appeals and petitions to God acceptably; praise and abide in communion with the Father, Son, and Holy Spirit; bring heaven to earth; discover hindrances to worship; learn the power of prophetic worship in defying the adversary; and find satisfaction -- all God has for you in Jesus Christ. Be energized beyond the basics. Be empowered even in adverse circumstances. Know Jesus better as you learn to persevere and progress in the way of Christ. Failure to enjoy the celebration of constant communion with God frustrates many, but the message to the Hebrews enables you to move into the depths of Jesus Christ while letting you discover all that is "better" about the New Covenant. 107 page course and commentary. In this Bible study you will learn to stand in the true grace of God as you discover that believers are born for glory, able to suffer by remembering the price of redemption, can live according to God's will, can rejoice and love the peculiar people of God, and move by grace through suffering to glory. In it you will increase your understanding of ministry, relationships, authority, and grace. This is a powerful study for those seeking answers to suffering, those needing to know the God of all grace, and those desiring to live godly in a hostile world. In this 15 page pamphlet, Dr. Mary Craig provides an overview of spiritual gifts followed by a detailed study of the gifts of the Holy Spirit in 1 Corinthians 12. Some discussion questions follow. Every war has weapons. The Christian’s weapons are spiritual. Every believer can be better equipped by taking up the weapons of our warfare, things like the Blood of the Covenant, prayer, fasting, the armor of God, the anointing, and many, many more. Learn the means of grace and how to utilize them effectively. Fight the good fight with the weapons God has provided. 67 pages. Make a donation to Mary Craig Ministries. Copyright © 2000-2019 Mary Craig Ministries. PayPal is a registered trademark of PayPal, Inc.